Update: ES-5 and ESX-4CV externals now available from the site. Before I make a big splash with this, I thought I'd post it here for some sanity checking by people who have been using Max longer than I have (i.e. more than 2 days). 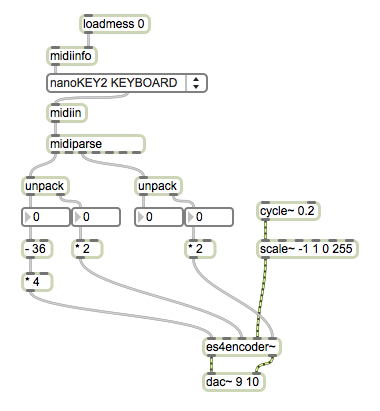 I've also attached a little test patcher, which hooks up a basic MIDI/CV converter, and an LFO. Thats great! works a treat for me. Does the mxo have something in it to limit the input max to 255, will it damage anything to exceed that? It's internally limited, but it wouldn't hurt anything even if it weren't. ES-5 and ESX-4CV now supported - see first post. At last thank you OS you are the MAN. Added videos to the original post. This alone has persuaded me to get an ES-4, awesome. i'm not sure why you would need max externals for the es3/es6. they can be accessed easily and directly through the dac and adc objects already. Indeed, no externals required for ES-3, ES-6 or the ES-7. Just my lack of understanding of Max. Thanks for the clarification. Hi, we can output sound from max to modules with the ES-3. I've heard you can't do that with the ES-4 cause of the conversion Stereo/5canals, it would be annoying... but is it true ? You can output audio via the ES-4 external, though it would of course be 8 bit audio. I'm a bit late, Os, but i want to to thank you for those object's. A w e s o m e !!! I am very surprised that there are so few reactions/discussions about this objects. It might be, because people don't get it to work completely (gates) and prefer the use of the vst~ solution instead. Since the conversion from binary to 8 physical gates needs some bit-shifting i thought i could post a solution to deal with that beautiful problem - for most of us, binaries could represent some kind of "unusual handling". The buttons are representing the 8 gates and can be switched on and off individually without changing anything else. the pitch (256) is divided "normally" by 4 (half-tones) which means that quarter-tones are easily found (*2) and there is still much more tuning possible with other- or even with variable factors! That is so cool! I hope i took a chance to do something useful - it would be a pleasure. Os - you're my man! It feels so much better than using VST. 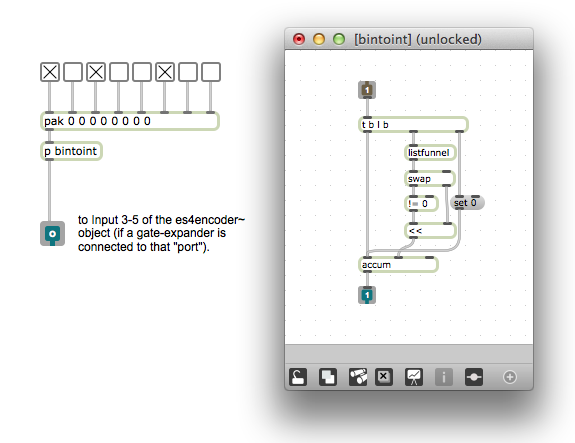 Now we can start to program some nice Max/MSP-ES-patches like Quadrature-LFO or even some crazier stuff. The LFO patch used in LFO Tutorial 5 by Gregory Taylor is GREAT! ... some more questions about the max-objects and the resolution (with ES-4 and expanders). do i get 4x 0-10V in a higher (12bit) resolution if i connect the ESX-4CV expander on the first header and the jumper is set to 0-12V? Or is it 8 bit anyway and the 12bit are scaled down to 8bit internally (because of the DAC)? Does esx4cvencoder~ want 4x 0-255 if the jumper is set to 0-12V? ... still speechless that i can't find any discussion about those objects! Are all ES-users already addicted to the vst-PlugIns? You get Ã‚Â±5.333V from the ESX-4CV. There are no jumpers that affect its operation. The ESX-4CV is always 12 bit. Thanks Os - you are extremely fast! As always! 1.) ES-4 Channels 1-2: 0-5.3V (when trimmed for 1V/octave response) - controlled via es4encoder~ is an 8bit resolution (256 steps). - ? 2.) ESX-4CV on the first or second header controlled via esx4cvencoder~ into es4encoder~ gives 4x 0-5.3V in a 12bit resolution (4096 steps)? 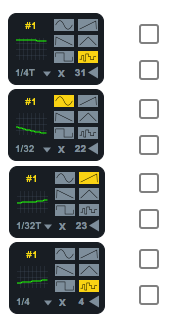 If 2x yes - is there any disadvantage when an expander is added to the channel? - because it seems to be just more channels and a better resolution! (and it's still a secret for me!?) - 4096 would be great for tunings! I use expanders on headers 3 to 5 now (2x CV, 1x GT). - if 2xYes i'll immediately add another 8TE! Also i will test it with my 4CV on ES-4 ch1 and add that to the maxhelp-patch (i'll send or post it after the test). I really love your modules! They are helping me a lot! Thanks so much! Have you ever checked the BEAP-project by Stretta? It's brilliant! Very straight forward. A real brain-booster on this topic! 2) Yes though you mean Ã‚Â±5.333V not 0-5.333V. The downside is update rate. The ES-4's outputs update at the audio sample rate (e.g. 48kHz). The ESX-4CV's update at an eighth of that rate (e.g. 6kHz). Does it mean i can't do that trimming with a ESX-4CV? (Jumper?) So i would have to cut the negative part and use 0-2047 to get 0-5,3V? Can i send 4x 0-10V on this channels (with jumper and ESX-4CV and 12bit/4096 resolution)? Or is ESX-4CV always 4x Ã‚Â±5.333V on any channel (and the jumper only works without ESX-4CV)? who has got that time when some long expected modules arrive....? Why would you want to not use the negative voltages?